The scale of the opioid crisis gripping the United States is hard to fathom. Since 2000, lethal overdoses from opioid use have tripled, and the problem is so widespread Centers for Disease Control researchers have concluded it is dragging down the national life expectancy. Though President Donald Trump has declared the epidemic a national public health emergency, he had not until Wednesday appointed an official to coordinate the major federal response experts say is needed to fight the problem. That the official he settled on is Kellyanne Conway should tell you everything you need to know about how little actual thought this administration has put into solving the crisis. Per BuzzFeed, U.S. Attorney General Jeff Sessions announced Conway—a pollster and Trump confidante best known for repeatedly lying to the public and who has no medical or public health experience—will be overseeing the White House’s opioid control efforts. 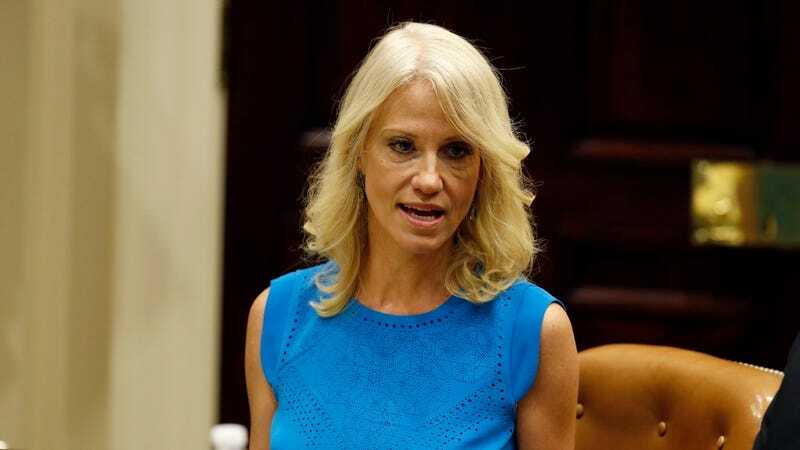 As Conway takes the reins, the BuzzFeed report noted, the White House has left the Office of National Drug Control Policy’s leadership role empty, failed to release any written opioid-control strategy, and has not requested funds to refill a depleted national public health emergency fund that currently sits at just $66,000. What will Conway bring to the table? Per the New York Times’ Maggie Haberman, assisting New Jersey Governor Chris Christie push through a commission report detailing how to fight opioid abuse has been part of her portfolio for some time. Christie’s report described the steps needed as relatively simple, per BuzzFeed, including limiting over-prescriptions, blocking Chinese fentanyl exports, and distributing naloxone, a drug that can stop fatal overdoses, to communities. But as Quartz noted, Conway’s public record of statements on the issue is sparse and far from encouraging. She’s characterized opioids as a “war,” said the “best way to stop people dying from overdoses and drug abuse is by not starting in the first place,” and suggested that individual “will” was as important as funding while defending Medicaid cuts. Later, Politico’s Sarah Karlin-Smith reported, the White House even dialed back expectations of how much time Conway will really be devoting to the issue. While the administration has paid lip service to the role of the health care system in saving lives impacted by opioid abuse, they’ve also proposed cuts to the ONDCP and cuts to grants intended to help workers displaced by the crisis. Republicans are clearly eyeing paying for their oncoming tax cut package with future cuts to health care programs for low-income people like Medicaid, and as the New York Times noted, if that bill passes projections show 13 million could lose health insurance as Obamacare premiums rise 10 percent. There’s been little to nothing from the administration about expanding access to naloxone, which could save thousands of lives. As Think Progress noted, Sessions’ speech on Wednesday instead emphasized diverting millions of dollars to law enforcement, consistent with Trump’s preference for heavy-handed police tactics and dated “Just Say No”-style advertising. While police have a role to play, the administration seems more interested in pretending that scientifically debunked War on Drugs-style enforcement will be enough to offset the lack of federal resources they’re actually committing on the treatment and prevention side. In other words, Trump’s administration is still fumbling its response to the problem at a time when it’s getting worse. At least 59,000 people and possibly as many as 65,000 people died from drug overdoses in 2016, per the Times, a staggering increase of 19 percent over the prior estimate of 52,404 in 2015. All we’re likely to get out of Conway is grandstanding exaggerations of how well Trump and crew are handling the problem, which is tantamount to it continuing to get worse.